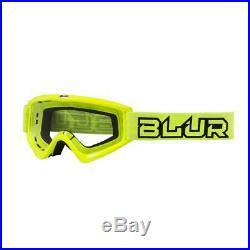 Great for MX, Dirt bike, Off-Road, ATV, BMX or Mountain Bike! 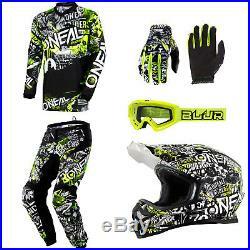 NEW O'Neal Element Jersey - Pants - Gloves - Helmet - Goggles Combo. Available Adult Sizes - sizing chart. Please make sure your sizes are listed below. 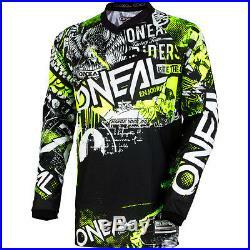 Jersey: S, M, L, XL, XXL. Pants: US 28, 30, 32, 34, 36, 38, 40, 42 (inches waist). 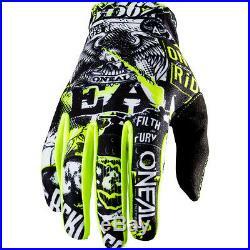 Gloves: 8 (S), 9 (M), 10 (L), 11 (XL), 12 (XXL). Condition: New with tags & Stickers! ELEMENT TECHNOLOGY: Entry-level gear built better than what the other guys offer on their premium line! The Element line brings you race ready graphics, superior materials, and comes in a wide array of colors and sizes to fit the entire family. Made with a roomy, comfy fit, the Element line takes on any rider with style. Comprised of top grade materials, the Element line provides excellent protection, with graphics that fit the fastest of racers! Extended tail that keeps jersey tucked in. Heavy duty but lightweight denier fabrics provide the perfect combination of comfort and protection while riding. 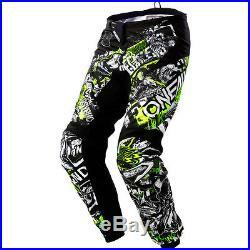 More durable, wear resistant panels on: seat, inside of legs, and knees. Lighter weight, more breathable panels, positioned away from bike contact points. 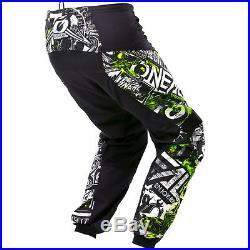 Stretch panels in key points on the front, back, and knees of pants for great freedom of movement. Elastic waist with adjustable ratchet closure system for a secure and snug fit. Protective rubber patches for extra protection when crashing. Tapered legs with elastic cuffs for a snug fit. Fully lined for added comfort. Removable, internal, EVA foam hip protectors. Lightweight, uncomplicated design for superb feel and comfort while riding. Simple slip-on design for great freedom of movement. Long lasting and flexible materials for the perfect fit. Super lightweight design with bold non-fade graphics. 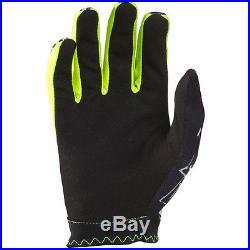 Synthetic leather palm with double layer thumb reinforcement. Pre-curved tailoring for the best fit possible, and helps to eliminate arm pump. Shell is constructed with durable Polycarbonate. Ultra-plush removable/washable padded liner keeps you cool and dry by wicking away sweat. Intake and exhaust vents for ventilation and cooling. 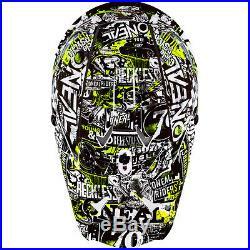 Durable multi-colored clear coated graphics. Meets DOT, ECE 22-05 and AS/NZS safety standards. Double buckle and high quality strap with silicone grip. Over The Glasses option available in black (OTG). That means no surprise charges when your item arrives. Important: size chart is listed in the product description, provided by manufacturers and listed for your reference. MX Outfit is not responsible if you select wrong sizes. Please note , order cost is not refundable. 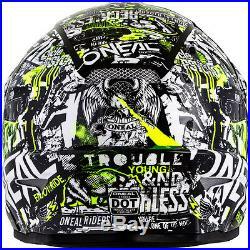 We sell genuine O'Neal products. 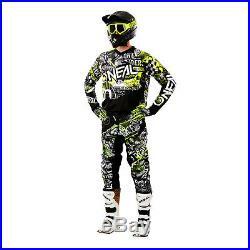 The item "ONeal Element Attack motocross dirt bike gear Helmet Jersey Pants Gloves Combo" is in sale since Monday, August 14, 2017. 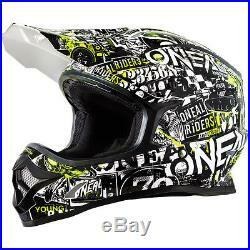 This item is in the category "eBay Motors\Parts & Accessories\Apparel & Merchandise\Motocross & Off-Road Gear\Other Off-Road Gear". 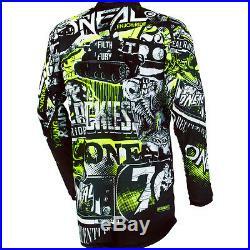 The seller is "mxoutfit" and is located in Chatsworth, California. This item can be shipped to United States, Canada, United Kingdom, Denmark, Romania, Slovakia, Bulgaria, Czech republic, Finland, Hungary, Latvia, Lithuania, Malta, Estonia, Australia, Greece, Portugal, Cyprus, Slovenia, Japan, China, Sweden, South Korea, Indonesia, Taiwan, South africa, Thailand, Belgium, France, Hong Kong, Ireland, Netherlands, Poland, Spain, Italy, Germany, Austria, Bahamas, Israel, Mexico, New Zealand, Philippines, Switzerland, Norway, Saudi arabia, Ukraine, United arab emirates, Qatar, Kuwait, Bahrain, Croatia, Malaysia, Brazil, Chile, Colombia, Costa rica, Panama, Trinidad and tobago, Guatemala, Honduras, Jamaica, Viet nam.